Mary Kelley investigates the history of women writers and why she learned so little about their role in literature while seeking her bachelor’s degree. Private Woman, Public Stage discusses the literary careers of twelve female novelists against the cultural backdrop of nineteenth-century America: Mary Jane Holmes, Maria McIntosh, Mary Virginia Terhune, Maria Cummins, Caroline Howard Gilman, Caroline Lee Hentz, Sara Parton, Catharine Maria Sedgwick, E.D.E.N. Southworth, Harriet Beecher Stowe, Susan Warner, and Augusta Evans Wilson. Kelley purposefully moves away from the theories of women’s submissiveness suggested in Barbara Welter’s “The Cult of True Womanhood, 1820-1860” and instead builds upon the model of “Republican Motherhood” wherein these women maintained both public and private selves but had to do so by seizing every opportunity to assert themselves within their working and personal relationships with men (xiii). While aware of the naysayers of women writers and sentimentality, Kelley finds power and progress in the literature and lives of these women as they functioned both within and beyond the sphere of literary domesticity. Divided into three parts, the book begins with the section “Peculiar Circumstances” covering the history of the literary marketplace, these writers’ new fame, education, and motivation. In an age marked by the growth of the publishing industry in America, through the onslaught of publishers, proactive editors like Robert Bonner, and the availability of subscription libraries, women increased their literary presence in the public sphere like never before. Pinpointing the beginning of literary domesticity to Catharine Maria Sedgwick’s A New-England Tale, Kelley notes that as the variety of periodicals increased so too did the number of women writers seeking to connect “creative effort with vocation” (11). By 1871, women represented three-quarters of the American authors who published novels that year (26). She argues that as these writers gained newfound fame, they were uncomfortable with the recognition they received in the public sphere (29). Some women wrote under pseudonyms, but each had to confront the past and contextualize their place in the progressive women’s movement of the present (37). Kelley challenges Barbara Welter’s theories by arguing that “the cultivation of female minds was only secondarily important” within society and that “a young woman could not fail to understand early that her future would be as a subordinate, supportive, and nurturing figure within the confines of domesticity” (57). Kelley demonstrates this within her biographical account of Catharine Maria Sedgwick’s education and inner conflicts about women’s roles: while Sedgwick’s father “awaken[ed] his daughter’s curiosity and anticipation” he also made it understood that it was “inevitable that she would later experience a sense of intense deprivation” (67). Kelley argues the more education women attained and the more ambitious they became, the “greater could be their sense of limitation and deprivation, of pointlessness and deep conflict” (77). When asking themselves “[W]hy do it?” and “[F]or what reasons, to what end?,” Kelley asserts that the women writers’ biographies and literary legacies attest to their anxious need to prove their intelligence, capability, and worth (87, 100). Part Two, “The Notice of the World,” discusses public criticism, financial concerns, time constraints, and gender roles and restraints. She begins by establishing society’s wariness regarding the novel on the whole, fear that it would negatively influence female audiences, and the harsh criticism it received (113). Kelley connects this controversy to the fact that ten of the twelve authors examined in her book began writing anonymously (126). This exposure to criticism suggests that when “the private woman stepped upon the public stage, a double exposure was inevitable” (137). According to her, during the nineteenth century a “‘happy woman’ was supposed to be the woman who married, had children, managed a household, and was materially supported by her husband,” implying that women writers who worked in this public sphere were both unhappy and writing because “for whatever reason, no man in their family was fully meeting that male responsibility” (139, 146). Kelley points to four literary domestics—Parton, McIntosh, Southworth, and Warner—who all initially wrote because they were in financial need and highlights Harriet Beecher Stowe’s comment that “I like every mother of family cannot afford to be literary except by buying my time from other duties” (164). This need to balance the private domestic sphere of family with the public sphere of publishing continues today. Sedgwick suggested that women had to choose one sphere over the other: “secure an independent home [and] have it” thus “avoid[ing] dangers and irritations and perchance save heartaches—that the world never knows or suspects” (179). This section concludes with comments on the negotiation of expected gender roles that literary domestics encountered; as Caroline Howard Gilman lamented of her first publication, it was “as if I had been detected in man’s apparel” (180). Kelley points out that this shame, guilt, or lack of pride in their work stemmed from social pressure that as women they were guilty of “wrongdoing” and had “betrayed her femininity and committed a male act” (181). Thus some women writers had to write secretly, attempting to disguise themselves as “nothing more or less than private domestic women” (184). Kelley’s final section, “Warfare Within,” begins by discussing the domestic content of these women writers’ fiction: “It was their only subject because that was the only subject in their lives” (221). When Catharine Maria Sedgwick chose not to marry, she faced great discrimination: “To be a spinster was not to be just an invisible woman, it was to be less than a woman” (238). For Sedgwick, her books became her metaphoric children because it was over them that she labored (246). Regarding questions concerning the morality these women’s texts and lives, no act was perceived more heinous than that of seduction (260). While love stories played a central role within many literary domestic novels, Kelley argues the authors “sought to remind themselves and…their readers of a higher, truer love” (268). Due to the fact that this love was thought to be the “selfless devotion and service to those in the home,” women writers continually felt conflicted about their writing careers (268). Consequently, female writers negotiated both spheres by “denying to herself and to the world that she had committed any transgression at all” and reframing their vision of an ethical world (286). Kelley ends her text by commenting that the equality and change literary domestics sought is “undeniable”; truly, “[t]he desire was to have the beat of the woman’s life finally heard” (318, 331). 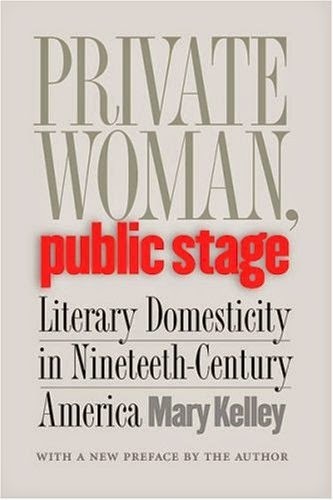 Kelley’s book is valuable to students of nineteenth-century American literature because it contains a comprehensive overview of the conditions that not only prefaced this great rise of women’s domestic literature, but also addresses the concerns and ramifications of the confluence of the public and the private. While Kelley’s extensive research enhances her ability to intermingle notes from each of the twelve women writers’ biographies, the structure and organization lends itself better to a cover-to-cover read as opposed to attempting to separate chapters by author. Kelley executes her premise well and clearly demonstrates to the reader what it really meant for nineteenth-century American women to negotiate private and public spheres.